The town of Royat, France has been famous since Roman times for its thermal springs, and visitors come to the town to take advantage of the healing therapies of thermal water at the region's many spas. Vincent Callebaut Architectectures recently won a design competition with their proposal for Green Wave - a thermal spa wrapped with a living wall that is designed to fit into the urban scene in the center of Royat while providing a center for healing. The new thermal spa, Thermes de Royat, is located in the heart of the city of Royat on an urban infill lot along a tree-lined street near a green mall. 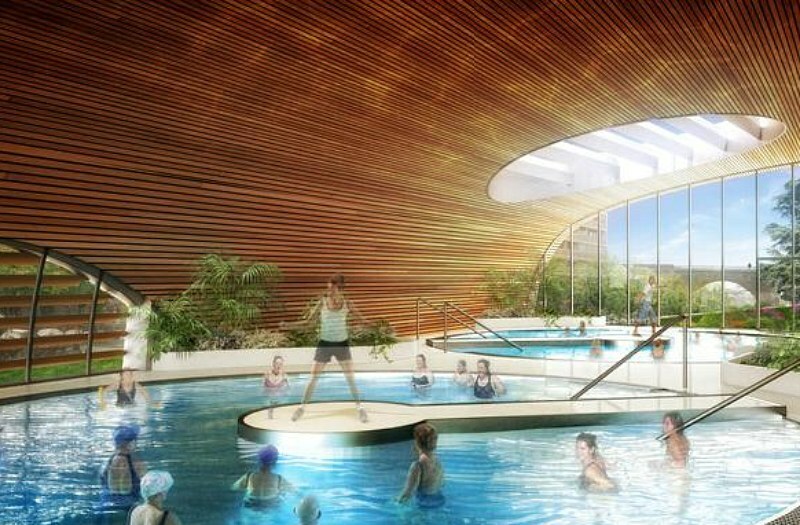 Inside, the spa includes changing rooms and two circular pools — one for resting and relaxing and the other for aerobic activities led by a therapist. The pools are naturally fed with thermal hot spring water, which is about as eco-friendly as it gets. Therapist-lead regular sessions with spa goers help improve cardiovascular health as well as rheumatism. Stilts hold the entire spa and pools up off the ground, making the stainless steel pools level with the street. The entire facility is covered in a wood louvered facade, but not closed off from the outside environment. A large living wall covers the wooden facade with a giant green wave, protecting the interior and creating a micro climate in the urban space. In the summer, the living wall helps ventilate and keep the spa cool, while in the winter the green mass helps insulate the space. A large skylight and tall windows provide natural daylighting for the space. The natural thermal springs wells up at the site of the planned spa, which will be built to provide a therapeutic and relaxing center for visitors and residents of the town of Royat, France. The spa includes two circular pools - one for relaxing and another for activity led by a therapist. The facade of the spa is covered in wave-shaped wooden louvers coated in a giant living wall/green roof. The spa is open underneath to the outdoor environment and the indoor temperature is maintained with the help of the living wall. The new spa is located in the center of the town on an urban infill lot near a large green space. A large skylight and windows on either end bring lots of natural daylighting into the space. The waters reflect the wooden surface of the green wave. Changing rooms are located next to the pools and the entire environment is warm, inviting, and covered in plants. The living wall/green roof provides a safe and acoustically pleasant environment for the spa goers. The roof also provides optimum thermal comfort in both the summer and the winter. In the summer, the green roof helps ventilate the space and keep the interior of the pool room from getting too hot. In the winter, the green roof acts as insulation, keeping the space comfortably warm. 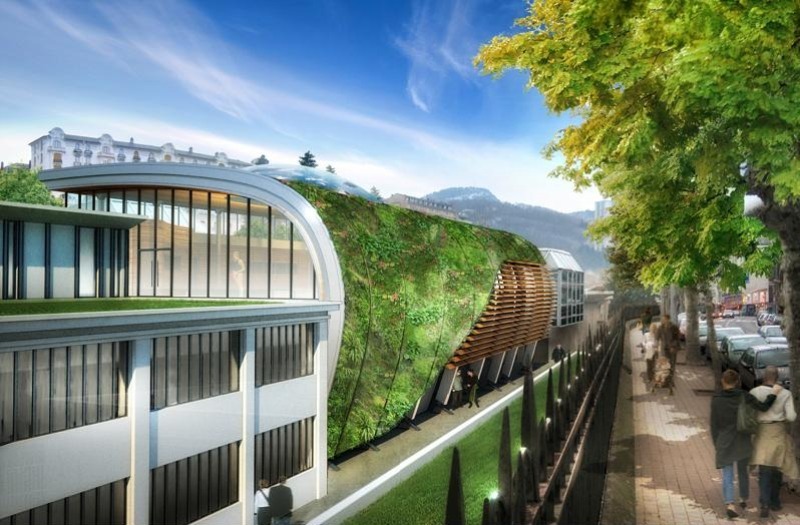 Vincent Callebaut won first prize in a design competition for the Thermes de Royat with the Green Wave proposal.